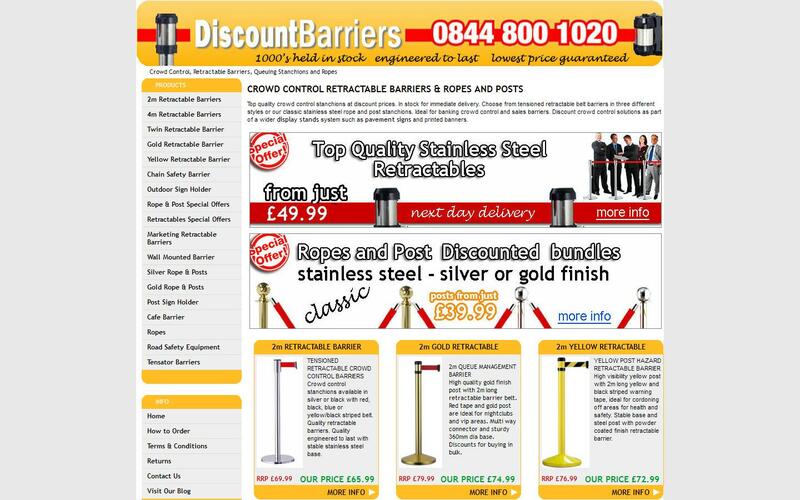 Discount suppliers of quality solutions, retractable barriers, cafe barriers, ropes and posts, next day delivery. You get more for your money with our Cafe barriers, each barriers is1750mm wide so you need fewer post . Posts are top quality stainless steel and have a heavy weight stable base. Banners are printed in house so quality and fast turnaround is assured. Cafe barriers are a very affordable way to maximise your outdoor seating area and increase revenue. Since the smoking ban cafe barrier screen are a cost effective way of creating a comfortable area for smokers. The banners can be branded with your logo or advertising message. Create your own unique outdoor environment increase your seating area and revenue opportunity with these cafe banner barriers and windbreaks. Our top quality retractable queue stands represent fantastic value for money and are engineered for the rigors of daily use. Ideal for use in reception areas restaurants, hotels and retail outlets where queue and crowd control is necessary. Four way fixing gives you the flexibility to create the optimum pedestrian flow. These barriers make public guidance easy. Retractable double strap saftey barrier system. retractable tape barrier system with added saftey of two tapess. Results in imporved queue control at trade shows, museums, airports and banks. A top quality stainless steel classic rope and post stanchions queue management solution. Made to last and stand up to the rigours of retail environments. Stable brushed effect base popular in banks, hotels , receptions, retail outlets. In fact anywhere that you need a crowd management system. 1m velour rope or 1.5m braided rope hooks onto classically designed stainless steel. We all like to keep costs to a minimum particularly in the current economic climate but a warning: choosing cheap retractable barriers with moving parts can be a false economy. Just writing to say we are all very pleased with our Cafe Barrier and custom printed banner. The print quality of the graphics is superb, really vivid colours. Quick delivery and well packaged, can't thank you enough.